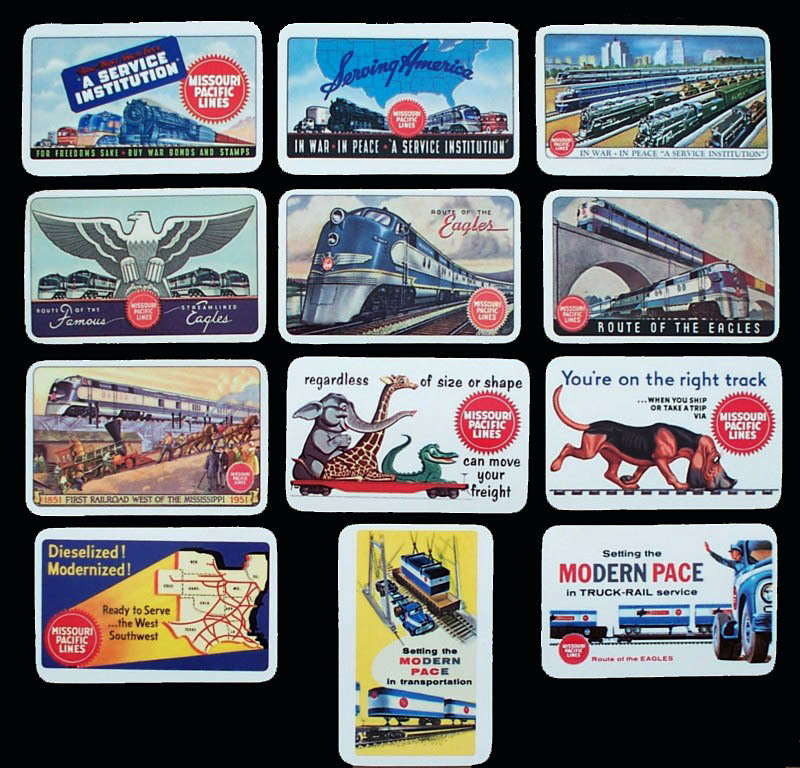 MOPAC (Missouri Pacific) pocket calendars are apparently being reproduced in large quantities. 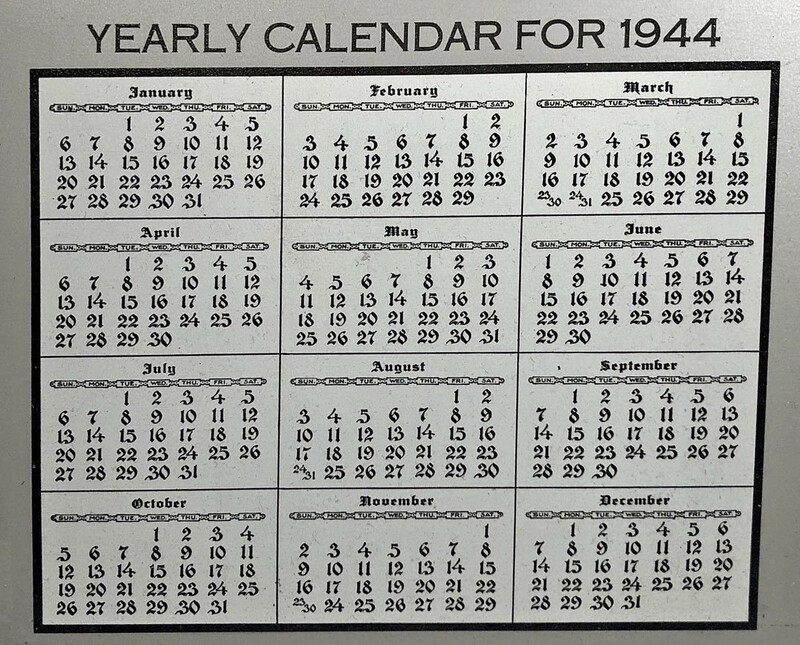 Suspect calendars exist for 1943-44-45-46-47-48-49, also 1951-54-55-56-57-58, and perhaps other years. Side by side, the reproduction calendars are fairly easy to spot, but on-line, it is more difficult to distinguish. The original calendars were manufactured of a cardstock paper material with a celluloid coating laminated over the surface to give a slick, durable finish. Over time, and particularly on more used calendars, the lamination starts to separate around the edges. The newly manufactured calendars appear to use a high quality image of the original calendar, which is printed on white coated cardstock. 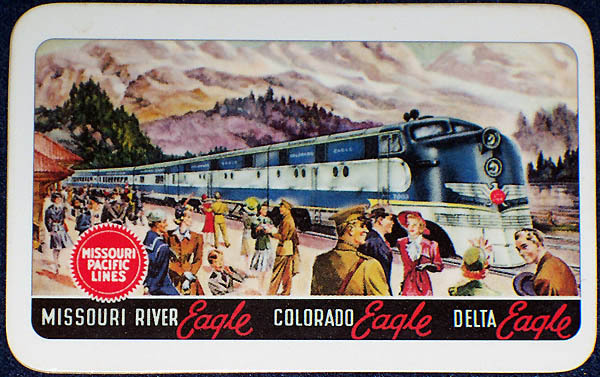 The reproduction quality is quite good, but there is no marking to indicate that these items were produced long after Missouri Pacific Lines disappeared as an independent railroad. Sold as reproductions, they fill in a collection nicely until original calendars are found, but sold as originals, they are of sufficient quality to fool even advanced collectors. See examples of these fake calendars at upper right; click on the image for a larger version. Distinguishing features of these fakes include (1) white borders are larger than originals, (2) the cardstock color is a stark white -- too white, (3) the colors are not quite as true as the originals, (4) the image itself is slightly "mushy", and (5) on the reverse - calendar side - the diesel and steam locomotives coming out of the buzzsaw at top of calendar have a lot of details obliterated, both (4 ) and (5) being typical of an image from a second generation copy. 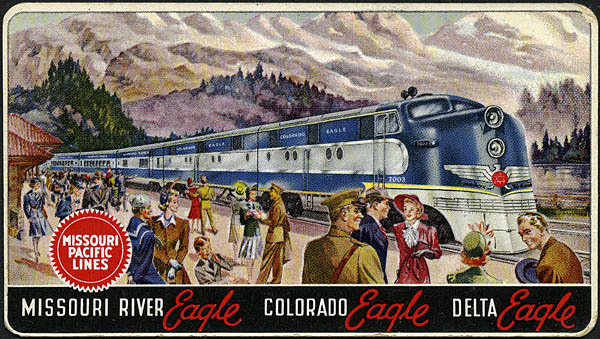 A reproduction of the 1943 version is shown at right along with a real version below that. Click on either image for a larger version. In comparing the two, you will note the awkward border alignment on the fake, versus the more uniform border on the original. This is due to minor differences in the size of the cardstock -- the "fake" is 3 1/2 by 2 1/4 inches, while the original is 3 5/8 by 2 1/16 inches. 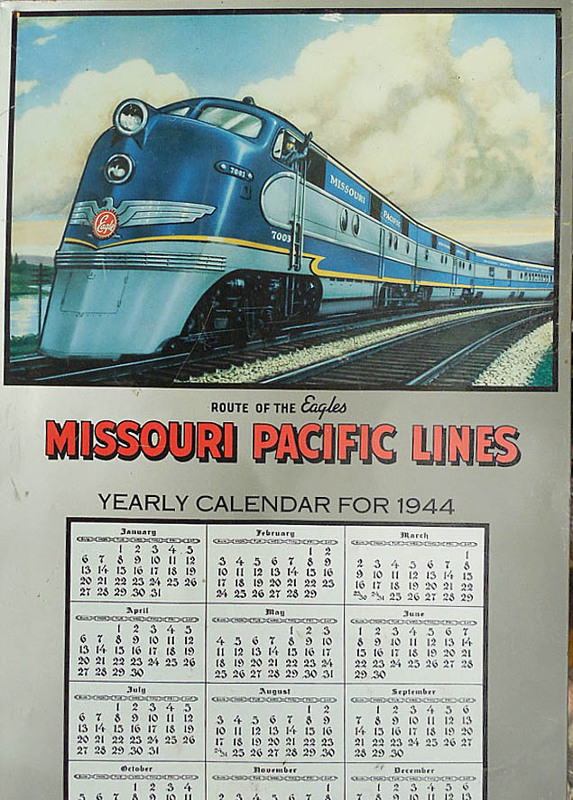 In 1948, Missouri Pacific replaced their steam (Sunshine Special) perpetual calendar with an attractive Eagle version. 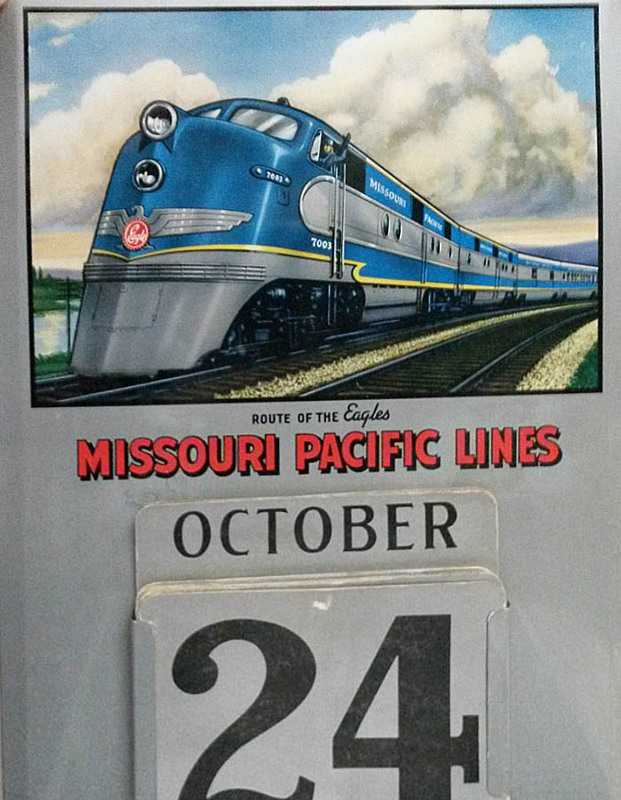 The calendar had cardstock numeral and month cards and was manufactured by the Donaldson Art Sign Company of Covington, KY. The calendar body itself is painted sheet metal with cardboard backing. 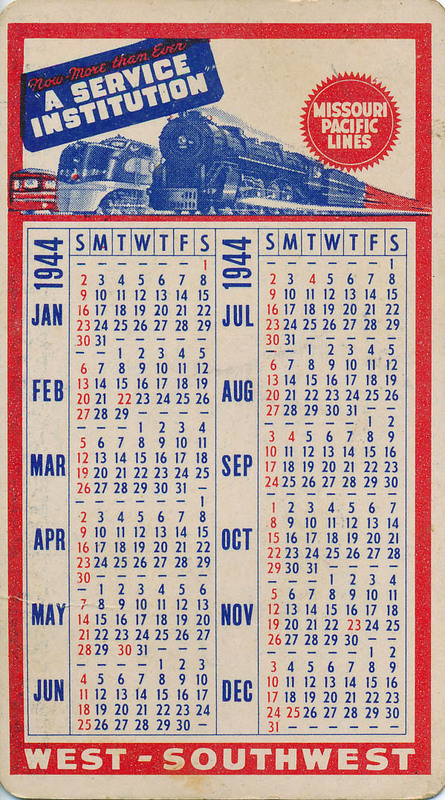 In recent years, a reproduction calendar has been made for a single year, 1944. The graphics are a reasonably good rendition of the original, enough that some collectors have argued that this is a legitimate MoP advertising calendar. Unfortunately, that premise is proven totally false when one compares the "1944" calendar on the fake with a true 1944 calendar. In 1944, both January 1 and July 1 fell on a Saturday, but on the 1944 fake, those dates fall on Tuesday. When purchased simply for the attractive graphics at a modest cost, the reproduction makes an attractive display piece, but when purchased at a high price by an unsuspecting collector, it discourages new collectors at a time when "new blood" in the hobby is badly needed. Shown below left to right: (1) original MP perpetual calendar, (2) fake 1944 calendar, (3) close up of fake 1944 dates, (4) accurate 1944 calendar dates. Click on any image for a larger version.